After being defeated by humans centuries ago, the Winged Tribe has lost their ability to fly. Seeking vengeance, a royal descendant of the tribe has begun searching for the magical Naga Pearls, which he plans to use to destroy the humans. When the legendary pearls fall into – and out of – the hands of Heiyu, a wily human street punk, he must join a team of unlikely heroes as they race to prevent the destruction of their people in this magical fantasy adventure. 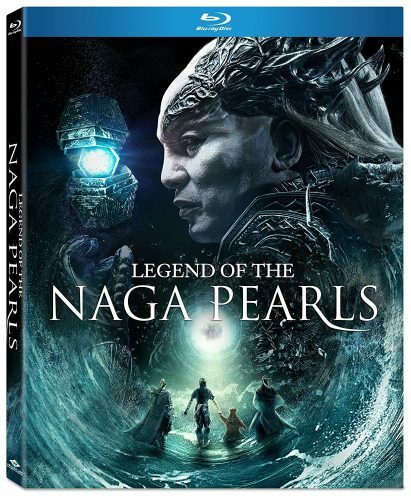 Legend of the Naga Pearls is an Action Adventure Fantasy that mixes decent action filled in with Heavy CGI and a hint of Comedy. Are male lead is a master thief with a hidden power that makes his hand glow and he has no idea why. Are main female lead is a non human that has ability to fly but her and are main villains the Winged Tribe cant. Only the Naga Pearls can help with this and throughout we have a powerful group on the search along with both are male and female leads whom team up. Who gets to the pearls first, who dies, what is that little creature are male lead has as a pet that passes gas? The Film has a good Story, its fun, filled with great looking CGI scenery. The action filled the screen throughout with good-looking fights and Villains that seem to be unstoppable. Now Some of the CGI could use work like the weird Creature are main lead has as a pet. It’s dreadfully fake looking it the world of live action but I have to say by the time the movie ends I found my self forgetting it and catching feelings for this little guy. Adventure Fantasy is what this movies and its heavy in that and I feel will appeal to those who love Asian Live action Fantasy films. Comedy wise I found my self laughing at are main lead as he is a bit of a character. Overall I enjoyed the film granted it’s not a Classic or a 5 out of 5 and may even not appeal to some viewers but for me I had fun. I treated it as a popcorn flick and just had fun with it. Other reviews pit this film at around a 2.5 to a 3 out of 5 stars. For me I feel it’s better. With that said I give this film a 4 out of 5. I say give the film a try to just have fun with it.